Doris Day continued to showcase her vocal talents through other entertainment media even before she left Les Brown and His Band of Renown in September 1946. Her popularity propelled her into radio programs, such as The Jack Kirkwood Show (CBS), The Sweeney & March Radio Show (CBS), Rudy Vallee Show (NBC); Your Hit Parade (NBC), The Bob Hope Show (NBC), kraft Music Hall (NBC), The Railroad Hour (ABC), and The Doris Day Show (CBS). Miss Day also appeared on other radio shows such as the March of Dimes, Buddy Clark Melody Hour, and those transcribed by the Armed Forces Radio Service. She also recorded song tracks for the transcription services provided by Standard Program Library, Capital Transcriptions, and World Program Service. Although it was radio that first brought Doris Day to our attention, singing was not Miss Day’s initial interest. She was a good dancer, teamed with her dancing partner, Jerry Doherty, and won a grand prize in a city-wide amateur contest. With the prize money, the dancing team and their mothers went to Hollywood. About a month later they returned to Cincinnati. The plan was to say their goodbyes and return to Hollywood. But on the eventful evening of Friday, 13 October 1937, Miss Day and her friends were involved in a terrible auto accident involving a locomotive. A shattered leg mended slowly. Miss Day on radio interviews has recalled that her recuperation took 14 months. While recuperating, Miss Day became interested in singing, which she indicated took about 8 months of voice coaching. During this time Mrs. Grace Raine became her vocal coach and imparted the knowledge and technique which would later mold Miss Day’s singing style. Her singing talents were initially showcased at WCPO in Cincinnati where she sang on a weekend amateur show. Through the assistance of Mrs. Raine, Miss Day then sang, regularly but without pay, on a WLW radio program called “Carlin’s Carnival.” Her newly developed singing style and her formative radio experience lead Miss Day to audition in 1939 for Barney Rapp. Barney Rapp owned a supper club, The Sign of the Drum, and conducted Barney Rapp and his New Englanders. It was Rapp who suggested Doris Kappelhoff change her name to Doris Day, because of her rendition of “Day After Day,” which she sang regularly on Carlin’s Carnival. Through Miss Day’s association with Barney Rapp came the opportunity for national exposure. On 17 June 1939 a radio program originated from the supper club. The show was co-produced by NBC and was broadcast through WLW Radio in Cincinnati. This was the first coast to coast broadcast of Barney Rapp and His New Englanders, and of course Miss Doris Day. 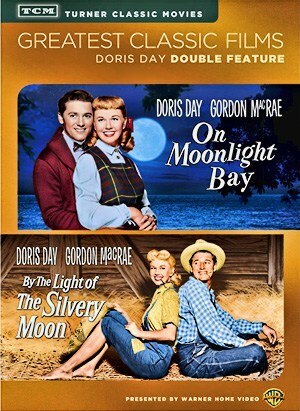 The broadcast featured two Doris Day tracks. These are perhaps her first recordings. After singing with Barney Rapp, Miss Day sang with Bob Crosby and his Bobcats in 1940 during a 3-month period. Afterward she sang with Les Brown and his band. Miss Day was with Les Brown during two distinct periods, August 1940 through mid-1941, and 1943 through fall, 1946. Between these two periods Miss Day returned to Cincinnati, where she auditioned in 1942 and joined WLW radio as a staff vocalist. She sang on The Lion’s Roar, WLW on Parade, and the Moon River programs. It was during this time that Les Brown heard her on radio and persuaded her in 1943 to return to his orchestra. 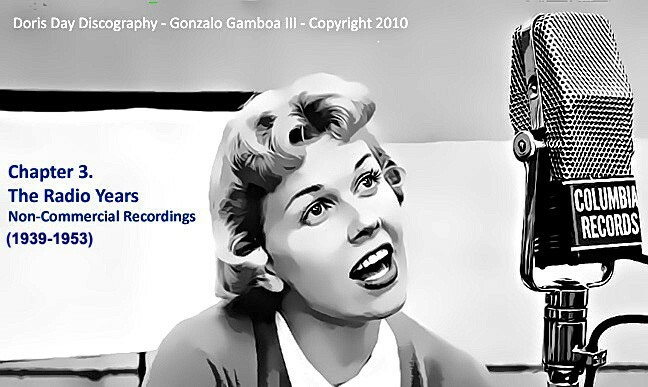 Note: Sometime in 1948 Doris Day sang It’s Too Soon To Know during a radio program, perhaps a Bob Hope Show. She also sang Love Somebody (date unknown). BH Show – A Blue Bird On Your Windowsill; Where Are You? Note: The Doris Day Show continued every week until 19 May 1953. More details will be provided at a later date.